This is our Worldmark Experience in 2011 – a most memorable and fantastic family holiday. Ballarat has it all!! WOW! 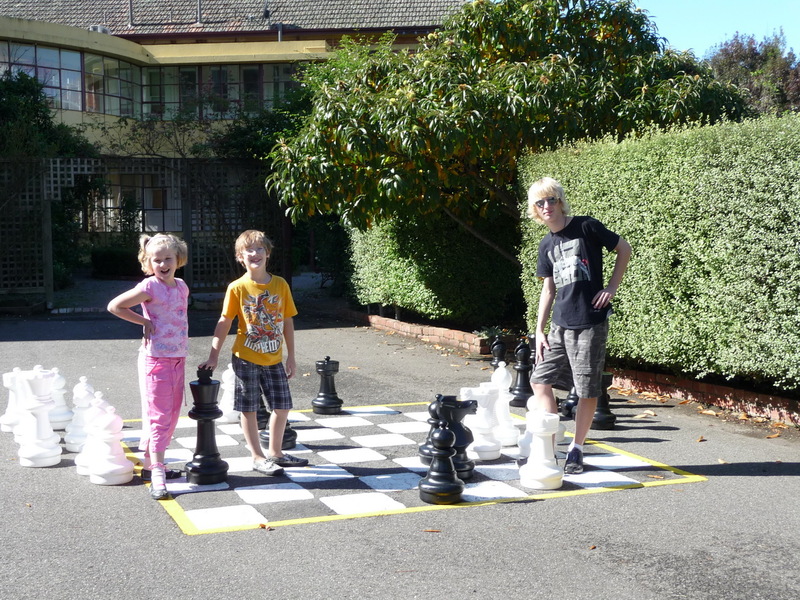 That was all we could say as we drove into Blythewood Grange at Beautiful Ballarat in the May School Holidays 2011. This magnificent paradise was to be our home for the next 10 days and we could hardly wait to start exploring. A rebuilt Home, then Orphanage, its’ interior is still that of yesteryear – 1878, beautifully detailed with its’ sweeping staircase and expansive grounds. Day 1. Unpack, settle in, explore the grounds and facilities, WOW, awesome, impressive and fantastic staff to help out every inch of the way. Then collapse into our sumptuous Queen bed … ahh better than home! Day 2. Grocery store just up the road to stock the pantry, fish and chips for lunch in a nearby park. The staff at Worldmark gave us a brilliant map to navigate our way around the tourist spots and to get the best out of our stay – complete with tricky little questions about each stop. We all have a ball finding our way around these ‘treasures’. First off was the Memorial Arch, then the Olympic rings at beautiful lake Wendouree. We went through the Botanical Gardens and spent the afternoon looking at the amazing Prime Ministers Walk, the garden walks, Norman Lindsay Gordons’ House and were lucky enough to see the magnificent Bergonia display in the huge Glass house. The hi-lite of the day for our three children was “The Park” on Lake Wendouree. It was the best park that we had ever come across and guaranteed another visit…I also found the name of a family member on the EX- POW wall . We went on a charming ride along the lake on an old tram. Delightful fun for the kids and wonderful volunteer drivers. To the Grange for a swim in the heated pool. Day 3.On with our Ballarat sightseeing tour … Very interesting at the Old Cemetery where the fallen soldiers and diggers are buried from the Eureka Stockade. We went inside the Town Hall and it is worth going up the old staircase to see the opulence of a by-gone era. Behind which is the magic old Carillion. Not to spoil it for future treasure hunters…We drove out to Soverign Hill and out to beautiful Bunnyiong where we had lunch at De Soza park. On to the lookout where everyone climbed the lookout tour, a little drizzly rain drove us out, but stopped once at La La Falls, very pretty area. Back to the Grange for a swim and relax in the heated pool. Divine. Day 4. Today was an early start as we headed down to the Great Ocean Road. We went via Geelong and had morning tea at lovely Lorne and yes, another great park. The Great Ocean Road and the Apostles was a magic day, the sun shone like gold on the rock formations and the beauty is forever etched in our minds. It was also a great geological lesson for the kids who enjoyed the many stops and walks along the way. Back home via Warnambool and Lismore. Appreciating that lovely queen sized bed to collapse into. Day 5. Today we had a relaxing day. We all played out the back with the Giant Snakes and Ladders, Chess set and wandered around the lake and grounds. We had friends over and had a picnic lunch by lovely Lake Wendouree and you guessed it – “The Park”. 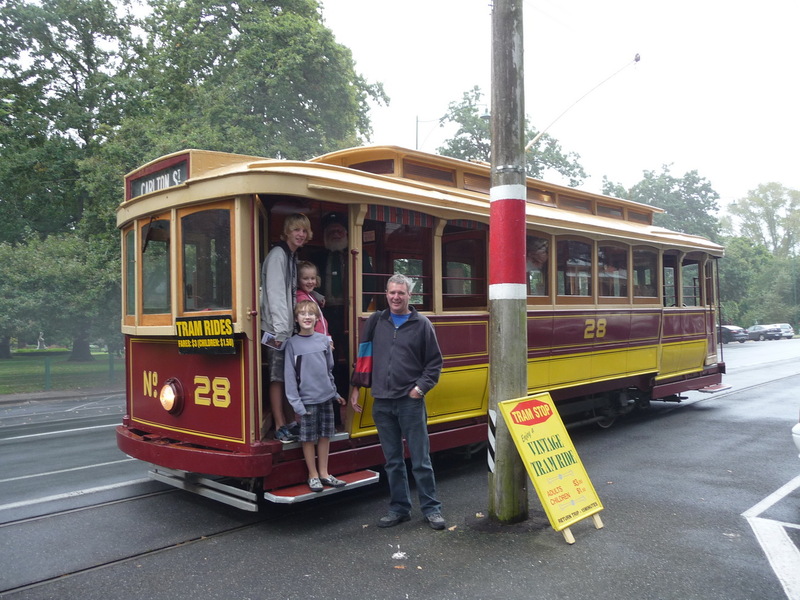 We re-explored more of the botanical gardens and went on another tram ride with our friends. Of course the kids had to have a horse and buggy ride around the Park to complete another great day in Ballarat. Tonight was a real treat. We went to see Blood On the Southern Cross and we all thoroughly enjoyed the experience. It was really spectacular and very educational – well worth a night out. Day 7. Today the sun shone and it was a beautiful autumn day. Friends came over and we had a BBQ lunch in the grounds under the gorgeous trees with their autumn leaves falling like rain. It was down to the pool again to relax in the afternoon, then of course the kids hung out in the games room. Did I mention that? Well, the kids are well catered for there, movies, ping pong, pool table, lounges etc. Our 3 had a lot of fun in there..
Day 8. A day of exploration and wonder. Off to Hanging Rock via Creswick, Daylesford (oh wow! ), and a walk and look at Hepburn Springs and a good spot for morning tea. On to Woodend to walk through and up to the summit of Hanging Rock where the movie was filmed. Of course we watched it before heading there. I huffed and puffed my way up, but boy was it worth it. Really great views and rock formations. The only hiccup was that of nature…a black snake gave us a visit on our way down…then a quick decend to have a picnic and icecreams in the huge parklands. A look through the museum and on to the Mighty big Memorial Cross at Mt Macedon commemorating the fallen soldiers in WW1. A delightful country drive and spectacular views from the Cross. Day 9. A quiet day at the Grange. A game of tennis on the courts, a walk around the grounds in the sunshine, a drive up to the Windouree shopping centre and back for another swim in that lovely indoor pool. More games room fun, movie and relax. Nice day in Worldmark. Day 10. Our last full day in Ballarat, sad yes,but all good things have to end. But not before we got up headed out to the gorgeous town of Castlemain and Maldon for a heritage train ride on the old steam train. Such a pretty, pretty tree lined town (as all towns are in Vic). We boarded our train at Maldon and had a delightful ride through the country to Castlemain. The kids loved it, chugging along. Stop at Maldon for Hot chocolate and snacks, then back on board for our return to Castlemain. We even got easter eggs given to us by a lovely volunteer bunny. Back in Maldon we went to the local bakery for hot pies and cakes….yummo. Then we came home via Smeaton to see Vic. 2nd largest old Steam driven Water wheel at the Andersons’ Mill. It was very interesting and the surrounding country and old arch bridge quaint. Final dinner of our holiday in Ballarat at the local Bowling Club. Day 11. Today we farewelled Blythewwod Grange and Beautiful Ballarat for our trip home. This was definitely one of our best family Worldmark holidays with so much to see and do and we only covered a fraction of it. But to be able to have ‘home’ days, and still be able to do awesome activities is great too, there are lots of activities at the Grange to do, such as paddle boat rides, the gym and sauna etc. and the staff are incredibly helpful and friendly. I would recommend this destination to both couples and families alike. Thanks for the memories and the wine…. This entry was posted in (VIC) Ballarat and tagged australia, Ballarat, goldfields, history, holiday, resort, vacation ownership, victoria, worldmark, Wyndham Resorts. Bookmark the permalink. Thanks for sharing your story, you made my day and the people of Ballarat appreciate it!